Jim McCaul -- No question that the market for new floating production systems has taken a battering. The past 12 to 18 months have been a difficult period for everyone in the business sector. Absence of new contracts has forced fabricators and equipment suppliers to make huge cutbacks in personnel and spending. But deepwater production will rebound – oil demand keeps growing -- and though the signs are mixed we see indications of the rebound starting. First some numbers about the state of the business. 261 oil/gas floating production units are currently installed on offshore fields. FPSOs represent 64% of the installations, production semis 15%, tension leg platforms 10%, production spars 8% and production barges 2%. 19 LNG regasification units and 92 FSOs are also in service. No FLNGs are yet in operation - but this is about to change when PFLNG Satu is delivered in April. Another 25 oil/gas production units are off field and available for redeployment, FPSOs account for 76% of the available units, production semis the remaining 24%. More than half of these production units are likely to be scrapped due to age and/or market conditions. The growth in the number of production floaters in service or available is shown in the accompanying chart. An additional 55 production floaters and 7 storage/offloading units are currently on order. Of these, 53% are FPSOs, 13% are another type of oil/gas production unit and 35% are LNG liquefaction or regasification units. The continuing imbalance of oil demand and supply has weighed on oil pricing and has caused many oil companies to cut back on capital spending plans. Brent crude in March 2014 was trading around $105 per barrel. By March 2015 the price had fallen to around $55 per barrel – and in late March 2016 Brent was trading around $40 per barrel. The nadir was on 20 January 2016 when spot Brent closed at $26 – a level far below the breakeven on many oil fields. As a result of the oil price collapse, daily announcements of lower capital spending have been common over the past six to twelve months – from majors like ExxonMobil to smaller upstream players like Premier, Cobalt, others. ExxonMobil, for example, in March said it will budget $23.2 billion in capital spending in 2016 – down 25% from the $31.1 billion spending in 2015 and 45% lower than the peak spending of $42.5 billion in 2013. While no one can predict the price of oil, we see the worse being over – and recovery underway. The world producers are talking about a production freeze, drilling of new shale wells in the US has stalled and – most important – global demand for oil keeps growing. Sooner or later supply and demand will come back into balance. While many things can disrupt and delay this rebalancing (e.g., downturn in the Chinese economy), we see a gradual recovery in oil prices over the next 6 to 12 months. This is not to say there will not be further dips. Oil prices are volatile. But the long term trend is upward. The huge inventory of oil in the market will limit near term price increases and the ability of shale production to rapidly ramp up will likely hold prices within the two digits over the next few years. But we see prices getting back to $60 to $70 by the end of the decade. We also see the potential for a supply shock that could send the price of oil into three digits within this time frame. A supply disruption in the Middle East is still a continuing threat. Mideast oil fields are in a volatile region. 0 20 40 60 80 100 120 140 Mar 2010 Mar 2011 Mar 2012 Mar 2013 Mar 2014 Mar 2015 Mar 2016 Brent Spot Price ($ per barrel) Meanwhile the brakes have been firmly applied to deepwater project starts. The last major FPSO contract was awarded in January 2015 – an FPSO to be used offshore Ghana. There also was a tentative contract in July 2015 for a production semi to be used in the GOM. These two contracts – plus orders for a handful of floating regas vessels – have been the total order intake over the past 15 months. This is far below the historical order intake pattern. 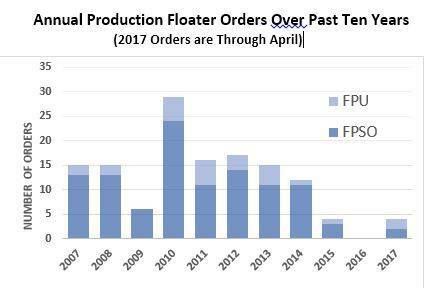 Contracts for an average of 12 FPSOs and 3 other oil/gas production floaters have been placed annually over the past ten years. Running in parallel with the overall market downturn has been an unprecedented implosion in Petrobras. The Brazilian oil company has been embroiled in a corruption investigation that has led to a financial and contracting meltdown. Petrobras’ situation needs to stabilize and begin improving before the company can again be a major driver of production floater contracts. Unfortunately, Petrobras’ problems have not been easing. The company’s credit rating was reduced to junk status in 2015 – and was further downgraded by rating agencies in Q1 2016. S&P in mid-February cut Petrobras’ bond rating from BB+ to BB and Brazil’s sovereign rating from B+ to BB with negative outlook. Moody’s in February downgraded all ratings for Petrobras as well as ratings based on Petrobras’ guarantee to B3 from Ba3. The impact of the financial pressures on Petrobras operations and capital spending are obviously being felt. In March Petrobras announced plans to lay off 12,000 staff – a 15% personnel reduction. Reports are circulating that the (already downsized) plan to invest $93 billion in capital projects over the next five years looks about to be cut to $80 billion. The Brazilian government is dealing with many problems and is increasing unable to provide financial backup to Petrobras. The Brazilian economy is deteriorating at an alarming rate – with GDP falling 3.8% in 2015, expectations of a similar decline this year and unemployment nearing 10%. One piece of good news is the deal Petrobras has negotiated with China to access financing. In late February Petrobras signed a term sheet with China Development Bank to access loans up to $10 billion in exchange for supplying oil to Chinese companies. But this news is overwhelmed by bad news that seems to flow daily about the company – and the Brazilian economy. The impact of this implosion on the floating production sector has been huge. Petrobras is the biggest player in the sector. It has more than 50 floating production units (mostly FPSOs) at various stages of planning. No other operator comes close to this projected procurement level. At the moment it appears that the Petrobras situation is not going to be resolved anytime soon. The political situation in Brazil is deteriorating and no one seems to be able to bring closure to the corruption investigation. Resolution could extent into 2017 – maybe later. Meanwhile Petrobras will be a weakened player and its ability to invest in new production floaters will be severely constrained. The FLNG market is looking a bit weak as a result of the LNG supply glut that has developed over the past year. Two FLNGs under construction have hit obstacles. One unit, the almost completed Exmar Caribbean LNG barge, is without a field as a result of the field operator’s decision to terminate the LNG project in Colombia. The other unit, PFLNG Dua under construction in Korea, has been “re-phased" by Petronas to curtail capital expenditures – and construction will likely be suspended once the hull is finished. Several planned FLNG projects have also run into barriers. In March 2016 Woodside decided to shelve its plan to use an FLNG to produce the Browse gas complex offshore Australia – saying market conditions did not warrant the investment decision. In the same month the Indonesian government rejected Inpex’ plan to use an FLNG on the Abadi field – saying a land based LNG plant is required. Earlier, in mid-Feb 2016 Hoegh announced it was terminating its FLNG projects -- and took a $37 million impairment charge against its FLNG assets. Hoegh joins Excelerate in exiting the FLNG sector. Excelerate in Sept 2015 decided to cancel its planned project to create an FLNG terminal in Texas, saying the project is not viable under current market conditions. FSRU contracts have been the bright light in the floating production sector. Five contracts or term sheets for floating regas units have been signed over the past year. However, some pending contracts for FSRUs are proving hard to tie down. The price of LNG has fallen significantly – which should provide incentive to switch to natural gas and generate requirements for regasification terminals. But the price of fuel oil has fallen as well – reducing budget pressure on power plant managers to switch to cheaper fuels. Then there is the difficulty of financing FSRU projects. An FSRU moored offshore can require $500+ million investment in infrastructure. This can be hard to finance. Unlike FPSO and other oil/gas export projects, an FSRU feeds gas to a local off-taker. The ability to finance such deals is limited by the creditability of the off-taker and the willingness/capability of the government to provide a sovereign guarantee. Overall, we see the FSRU market continuing to be strong – but given the financial barriers to these projects, closing deals will require patience and financial creativity. But obviously the underlying drivers need to improve before investment activity rebounds and planned projects turn into orders for floating production systems. Until there is improvement in oil prices, field operators will be reluctant to invest in new production equipment. In late March we examined the projects in the planning stage to identify those likely to reach an investment decision over the next five years – assuming underlying drivers improve. Of the 242 projects in the planning pipeline, we see 107 of these projects reaching the investment decision by end 2020. Based on our analysis, we see near to mid-term projects in the planning stage potentially generating contracts for 82 production floaters between 2016/20. The forecast includes 46 FPSOs, 11 oil/gas FPUs, 4 FLNGs and 21 FSRUs. We also expect orders for around 25 FSOs. In making this forecast, we have assumed that the price of oil will remain in the $40 to $50 range through 2016 – then climb to the $50 to $60 range in 2017/18 and to $60 to $70 in 2019/20. We have also assumed Petrobras’ problems will continue through 2017 – limiting the company’s capability to finance new projects. But from 2018 onward Petrobras will be fully back in the market and/or the operating rights to some pre-salt blocks offshore Brazil now managed by Petrobras will be contracted to international players. Further, we have assumed there will be significant (20 to 30%) cost reductions in the deepwater supply chain as competition for available contracts tightens, local content requirements ease and operators negotiate more favorable revenue sharing arrangement with resource owners. The result will be to lower the breakeven price of new deepwater projects. A list of 19 projects we see potentially producing orders for production or storage floaters over the next 18 months is provided in the accompanying table (next page). Details for these near term projects – as well as details for 88 other projects in the planning stage that have potential to produce EPC contracts over the next 18 to 60 months -- are provided in the March 2016 WER Floating Production Report. We indicate in the report when the EPC contract is likely to be awarded with the next five years – within the next 18 months, 18 to 36 months or three to five years out.